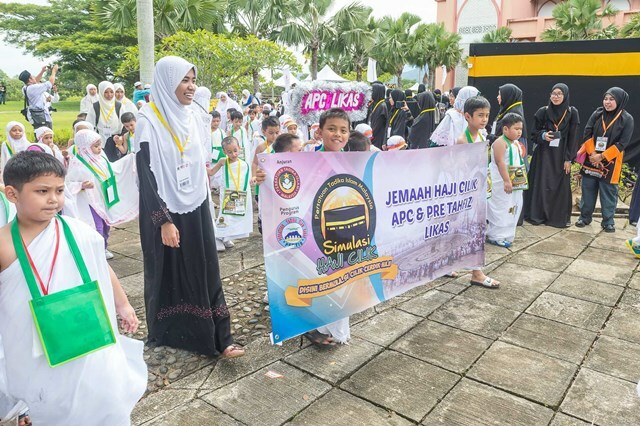 MONDAY, 26 SEPTEMBER – A total of 500 preschool children from 33 Islamic Kindergarten around Sabah recently joined a Hajj simulation Programme held at Universiti Malaysia Sabah (UMS) Mosque. Jointly organised by the Islamic Centre of UMS, Sabah Islamic Kindergarten Association (PERTIS) and the Sabah Pilgrims Management Fund Board, the attendance was encouraging where some came as early as 7.00 am. The children who came wearing ihram clearly were eager in performing the Hajj simulation and made tawaf around the Kaabah model accompanied by their respective kindergarten teachers. According to the Director of UMS Islamic Centre, Dr. Muhammad Suhaimi Taat, the Hajj Simulation Programme taught and gave an exposure to preschool children on the theory and practical part of performing the Hajj in Mecca. “Alhamdulillah, educating of religious values through this Hajj simulation is very good and in line with the philosophy of the National Education policy, to produce a balanced human capital in terms of physical, emotional, spiritual and intellect,” he said when officiating the event on behalf of the Vice-Chancellor of UMS, Prof. Datuk Dr. Mohd Harun Abdullah. A participant, Nur Adriana Arischa from Pusat Minda Lestari UMS expressed joy in participating the activity, specifically to learn about the practice of tawaf around the Kaaba and Saie. “I hope to be able to follow such programme again in future,” she told UMS media.